The Leesburg Bakers Dozen 13 hour race is this weekend and it's shaping up to be a nice one with temps predicted to be in the low 80s. I'll be out there on a team with 2 lovely ladies and a bunch of the other Factory Team kids will be making appearances as well. The course should be fast with all of the dry weather we had. Look for our camping compound and stop by to say "hey". 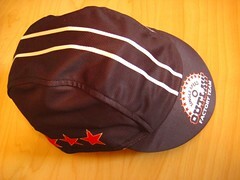 I got in a batch of SSO cycling caps that I'll have on hand at the race. $20 gets you one. Whatever is left over will be available next week through the web site for a dollar more to cover shipping. 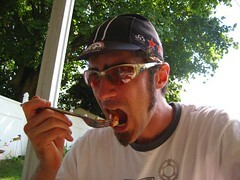 We will use proceeds from the sales to cover our donations to local trail advocacy group MORE and the big ones at IMBA. We don't just put shovels to the dirt, we put our money where our mouth is. Please try to ignore the model in the photo below and focus on the hat. It's made by Pactimo of a nice wicking material. Slips under a helmet nicely if that's your thing and it's easy to crumple and pack in a jersey pocket if you need to do that too. One size fits most.